MP-18b Bluestreak? Toyko toy show 2014 exclusive? Discussion in 'Transformers News and Rumors' started by Kenchanayoh, Jan 29, 2014. Just a quick update, all pre-orders should have shipped out already. We're working on orders of MP-18S that came in the last two days. We should have them all out by morning. thanks everyone! Just bought this from BBTS. They are in stock. didn't expect this to be in stock so soon. How much is shipping from robotkingdom? HolyCulture I'm so much a toon guy that I framed Roger Rabbit. Mine was $17 to ship to Korea. Not a terrible price but that's probably because I collect the coins too. Yep, that is an amazing custom! (I couldn't wait for an official; I've commissioned that customiser, nellie131, to paint me one the same, it looks too good ). Never thought I'd like a repaint more than the original release, but this MP-18S Silverstreak is pretty damn AWESOME!!! 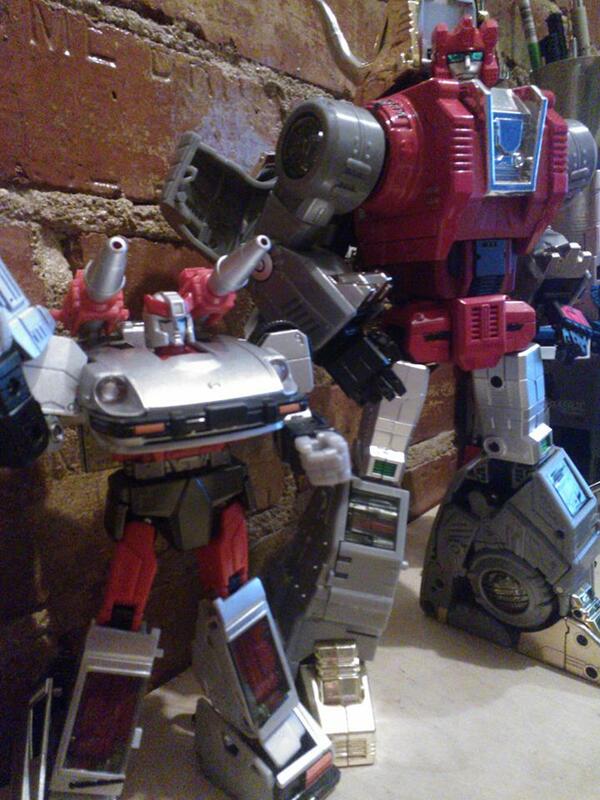 Just finished uploading my video review of MP-18S Silverstreak over on the Kool Kollectibles YouTube channel. Hope you can all check it out, subscribe, like, and comment with your own thoughts! I would almost consider buying that if I wasn't strictly interested in toon accuracy. I'd really like to see this for all those interested in diaclone repaints. Just got him in with Wheeljack as a way to shave Jacky's shipping cost. It was him or Smokescreen. I'm happy that I did, he's killer! I tend to prefer toy accuracy, and I don't care about Diaclone much, so this silver painted devil is the winner between the 3 variations of this character, for me anyway. I may as well order the Fan Style hands and Reprolabels for him and Smokey, since I have Prowl upgraded and Smokescreens appearance on my shelf is inevitable. C'mon Bumblebee! So I know the masterpieces are a bit larger scale than g1, but is blue streak of such an enormous size that he'd look ridiculous in vehicle mode next to a g1 jazz? I read that around this time, or the release of this mold, the figures had begun to scale back a little bit in size. Thanks. So still no rumors on a blue Diaclone version release? I would assume they will want to milk this mold as long as possible. I just hope Hasbro doesn't save that idea for some SDCC exclusive most will not be able to get. At least SDCC would mean it was actually happening. At this point I really am starting to have my doubts. I'd happily pay SDCC type prices if it actually got made. Don't get me wrong, a general release would be preferred. It just isn't looking very likely to me at this point. I guess with 4 different toys out of the mold (including Smokescreen) it's not a priority. You do realize this is Takara you're talking about right - the one who'll do repaints/retools no matter how obscure? They'll make one, not now maybe, but they know the market is out there. The same could be said about the original Bluestreak mold though. Which has still never been reissued by Takara (or anyone) as a Transformer. Considering we're getting Exhaust though I feel a MP Blue Bluestreak has a better shot though there's still no guarantee.